In the hour of difficulty and trial we are plagued with doubts, we do not understand the meaning of the events of the world and of our life. The temptation not to feel adequate, up to it assails us, so that the choice not to continue the journey takes root in us, and we don’t realize that God favors us, He calls us and asks us to follow Him, putting ourselves at His unconditional disposal. Despite our indifference and refusal, the Lord is not discouraged and does not give up. He patiently sits at the door of our heart and waits for us to finally mature the decision to open our lives to Him. He always encourages us not to be afraid, because we too have found favor with Him. God is with us from our first moment and will never leave us. We are not orphaned, but our life is inhabited by His presence, under the sign of His lordship, in His hands. We are what happens when the Lord comes. Everything in us is His visit, His love that is given to us, His forgiveness to start again, not commensurate with what we were or did. The Most High became the son of Mary to be like us, one of us. He lived like us because He wants us to become like Him. The source of our life is in Him. True joy originates from our return to Him so that He can continually renew us and keep us. Only in God will we find the strength to face difficulties, dangers and misunderstandings and become bearers of hope. The divine realities are always mysterious, arcane and in front of their unveiling it is normal to be enveloped in fear. However, this is not the only reason. Mary, although still a young girl, knows the history of salvation well. She knows that in the past such greetings were addressed to the great personages, to whom God entrusted the mission to lead Israel along the paths of liberation and covenant with Him. For this reason she is distressed and wonders about the meaning of those words. She is aware of her own insufficiency, of Her condition as a simple and poor woman, daughter of humble people. Maria strives to grasp the meaning of that event that makes Her waver, of those words that she understands in their meaning, but that She can not fully relate to herself. She feels a fragile girl like many others, who is unworthy of the infinite love of the Father, and is constantly struggling with Herself to overcome her limits and try to conform Herself to the Word. Mary thinks a few moments in silence, she ponders those words inside herself, she looks into herself: she is only a young woman, who is a virgin and betrothed to a man named Joseph, from whom she can not have a son because she does not live with him yet. Humanly what the angel says to her it is not possible that it can come true. In the book "The Virgin Mary in the Kingdom of the Divine Will", Luisa reports what the Virgin Mary experienced when the angel Gabriel entered her house in Nazareth. The Virgin Mary continued her Life in Nazareth; the Divine Fiat continued to expand Its Kingdom within her. It used her littlest acts, even the most indifferent ones—such as keeping the little house in order, starting the fire, sweeping, and all the tasks that are usually done in the families—to let her feel Its Life Palpitating in the fire, in the water, in the food, in the air she breathed— in everything. And Investing them, It formed over her little acts Seas of Light, of Grace, of Sanctity; because wherever It Reigns, the Divine Will has the Power to form, from little trifles, New Heavens of Enchanting Beauty. In fact, being Immense, It does not know how to do small things, but with Its Power It gives Value to trifles, and makes of them the Greatest Things, such as to Astonish Heaven and earth. Everything is Holy, everything is Sacred, for the one who Lives of Divine Will. 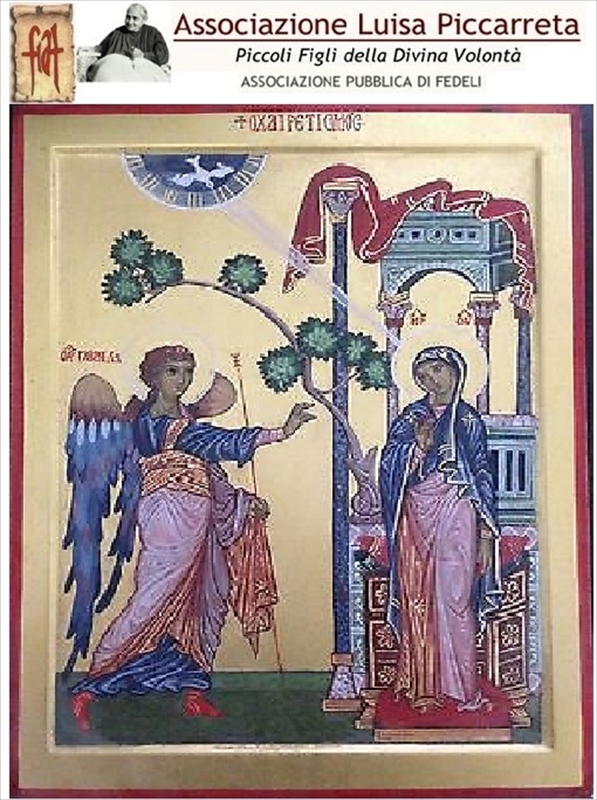 Several days before the descent of the Eternal Word upon earth, the Virgin Mary could see Heaven opened and the Sun of the Divine Word at Its doors, as though to look out for the one upon whom He was to take His Flight, to render Himself Celestial Prisoner of a creature. How Beautiful it was to see Him at the doors of Heaven, as though on the lookout, and to spy the fortunate creature who was to host Her Creator! The Sacrosanct Trinity no longer looked at the earth as alien to Them, because there was little Mary who, by possessing the Divine Will, had formed the Divine Kingdom in which He could descend safely, as in His own Dwelling, in which He would find Heaven and the many suns of the many Acts of Divine Will done in her Soul. The Divinity Overflowed with Love, and removing the Mantle of Justice which, for so many centuries, They had kept with creatures, They covered Themselves with the Mantle of Infinite Mercy, and decreed among Themselves the Descent of the Word, and were in the Act of sounding the Hour of the Fulfillment. At this sound, Heaven and earth were Astounded, and all stood at attention, to be spectators of such a Great Excess of Love, and a Prodigy so unheard-of. So, the Virgin Mary pronounced her Fiat, and the two Fiats fused together and the Divine Word descended into her. Her Fiat, which was Endowed with same Value as the Divine Fiat, from the Seed of her humanity, formed the tiny little Humanity which was to enclose the Word; and the Great Prodigy of the Incarnation was accomplished. whom Heaven and earth could not contain. “O! Prodigy of prodigies, which only a God could do.